With its July 2012 decision regarding the Access Copyright tariff for Kindergarten, elementary, and secondary education (K─12), the Supreme Court of Canada clarified how the fair-dealing provision in the Copyright Act applies in an education context. 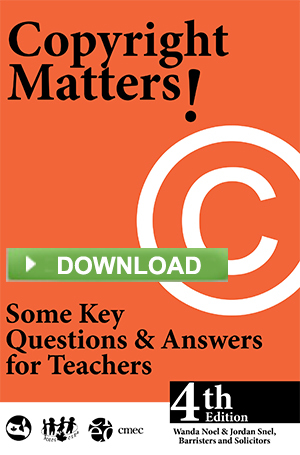 According to this decision, teachers in Canada may make copies of short excerpts of a copyright-protected work for students in their classes without having to obtain copyright permission or pay copyright royalties. The decision puts Canadian teachers on a level playing field with teachers in other countries like the United States and Japan. The CMEC Copyright Consortium was instrumental in bringing this issue to the Supreme Court of Canada and is pleased with the court's decision. CMEC has published Fair Dealing Guidelines to assist teachers and school administrators deal fairly with copyright-protected works.